For my 99th, 100th, and 101st posts, I thought I'd present to the general public my grand tale of exploring the post offices of Long Island's Fire Island. This was a three-page article published in the Post Mark Collectors Club (PMCC) Bulletin July 2011. Here I'll present more visuals, including photos of the offices and of the island itself. I’ve visited as many as 28 post offices in one day. That includes driving to each office, taking photographs, waiting in line, negotiating / chatting with clerks, and obtaining each postmark. Visiting the seven post offices on Fire Island, however, took two [mostly-]full days. Part of the postmarking difficulty is that no cars are allowed on the island, except for critical maintenance vehicles. For intra-town trips, the locals’ primary mode of transportation, aside from their legs, is the bicycle. 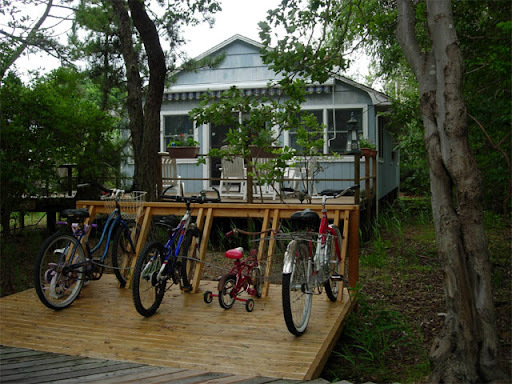 Many houses sport multiple-bike racks in place of garages! A water taxi operates between Fire Island towns; fares range from $7 to $30. I opted to walk. Ferries are crucial to the transport of people, goods, and mail to and from Fire Island. (And as such, every Fire Island post office is located by its town’s ferry terminal.) Ferries operate from Bay Shore [link to a Going Postal entry about Bay Shore and its Pantatquit Station here], Sayville, or Patchogue; Fire Island’s six CPOs are assigned to the town whose ferry services that CPO. Bay Shore is the parent office of the Kismet, Saltaire, and Fair Harbor CPOs; Sayville is in charge of Cherry Grove and Fire Island Pines; and Davis Park is assigned to Patchogue. Ocean Beach is the only independent post office on Fire Island, and it is also the only one that operates all year. 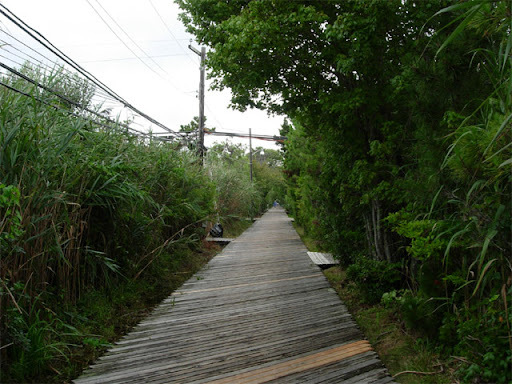 Fire Island boasts thousands of summer residents and annual visitors, though only 500 people live on the island year-round. The CPOs operate only during the summer and most close prior to Labor Day, though Cherry Grove’s operates through mid-October. Parking was free at Robert Moses State Park that morning since it was raining. The 1.6-mile walk to the Kismet post office took 35 minutes and I arrived 20 minutes after opening. Two people couldn’t tell me where the post office was, but I found it in the only store in town (even though there was no signage). There was no official postal counter – just a giant sack up front for outgoing mail. The manager took care of my cards for me in the back, at a table behind the deli counter. Saltaire is adjacent to Kismet, and their post offices are separated by about 1,500 feet apart spatially. But as the only road that connects the towns follows the southern shore of the island, actual walking distance is nearly a mile. The roads (rather, walks) in Saltaire are actually raised boardwalk, which lends the town a wonderful and unique character. Just past the town playground and park, the post office shares a building with the Village Hall and Courthouse. I arrived just after opening, and the contractor was happy to cancel my cards and pose for a photo with the post office sign. I swear it's got to be one of the fittest communities in America, given how much exercise these folks get.